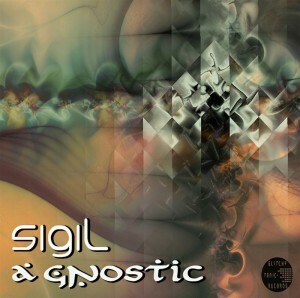 A Gnostic is the debut release from Sigil, written from a beautiful hideout in the forested mountains of Portugal. It celebrates model agnosticism (a la Robert Anton Wilson) and acts as a gnostic rebellion against materialism carrying over from previous times. These four tracks are musically diverse, representing an original take on downtempo psychedelia that is both glitchy and melodic. Artwork created by Dharini. Mastered at Anti-Logic, Berlin. MP3 Download | FLAC Download | WAV Download · Download count: 7,327. Really cool, unique release. Glitchy yet groovy with none of the ridiculous sounds of artists like Mr.Bill (whom I love). 5/5! With compliments, a creativity that stands out !!! Врать не буду! Хорошая вдумчивая атмосферная, и позитива много в её атмосфере, музыка! Спасибо!!!! Thank you everyone who had a part in producing and releasing this work of art! I learned a lot after researching Robert Anton Wilson, and I would not have done so if this wasn’t a production of superb quality! I particularly love Materialism, and the samples used in it! If Sigil see’s this, can you provide some background as to where you got your samples from in this song? I would love to further research this topic! The most inclusive work here in my opinion, as it clearly interests me on several levels, not just musically! Great work! Thanks again! Thanks for the comments and feedback everyone! Jesse: Realy glad you found some interesting ideas via the EP, that makes me really happy! Robert Anton Wilson left behind an amazing body of work that has had a massive influence on me over the years – I’ve enjoyed all of his work that I’ve read but personally i’d reccommend you reading Prometheus Rising, Quantum Psychology and Cosmic Trigger, all really deep and interesting books! The samples in Materialism are of Rupert Sheldrake. He’s a former don of biochemistry at Cambridge University who has fearlessly questioned accepted dogmas of the materialist paradigm that he feels has become a barrier to free and open minded scientific thought and experiment. I only discovered his work last year but I totally love his perspective and whole vibe. He always comes across to me as intensely intelligent, humble and full of wonder – and his work on “The Science Delusion” has provided me with a rational basis from which to challenge accepted materialist dogmas. Have really been enjoying this release lately, many thanks Sigil and everyone involved. Sheldrake was also good friends with McKenna I believe. They shared a discussion / presentation or two in the old video archives, if I recall correctly. Very cool. Thanks. I like the Rupert Sheldrake samples. What models of synthesizers sound? sorry “synth” not sure I understand? Are you asking what synths i used on this? If so, the majority of its done with the on board ableton synths, particularly operator. And the more organic melody bits with the ableton physical modelling synths… The only synth VST used was diversion, mostly just for some of the more twisted up saw lines cos it has a killer 48db band pass filter that goes all the way up. Yeah book of changes, sheldrake and mckenna did quite a bit together i think. They did some three way chats with Ralph Abraham too that are up for download on the psychedelic salon podcasts at the matrix masters site. Some good stuff there! This is just awesome work! Listened to this one so many times, and now it’s time to comment! Amazing sound, this is the reason I keep coming back to Ektoplazm. To find gems like this! Found a couple of tracks on compilations, then found this. Lovely work on this EP, thanks for download!